For those of us that watched the Georgia Bulldogs defeat Oklahoma, it was a great day to be a Bulldog. While Nick Chubb, Sony Michel and Jake Fromm were doing their best to keep the Bulldogs in the game during the first half, a bespeckled place-kicker practiced kicking the ball into the practice net behind the Georgia bench. With one-second left in the first half, Rodrigo Blankenship was called upon to attempt the longest field goal of his Georgia career. The ball was spotted on the Bulldog 45. If successful it would pull his team to within two scores of the mighty Sooners. He hit the ball solidly and it cleared the crossbar with room to spare. 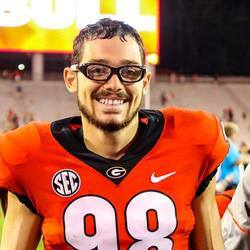 Rodrigo Blankenship had solidified his standing as one of the best place-kickers to have ever worn the red and black. The 55-yard field goal was an all-time Rose Bowl record and would turn out to be the turning point for the Bulldogs as they turned the game around and went on to a 54 - 48 victory. With this win, they will now play for the National Championship against fellow SEC stallworth Alabama in Atlanta. How many Dawg fans really know the history of the young man that may just be the best place-kicker to ever come out of the state of Georgia. A young man who was so dedicated to Georgia football that he turned down a full scholarship to Florida, among others, to walk on at the University of Georgia. Take the time to read the history of this young man . . . It borders on the unbelivable as far as positive achievement's are concerned. Rodrigo earns Football Writers Association of America ( FWAA) - 2016 Freshman All-American status — that’s 7 years in a row ~ Updated through Dec. 3, 2017. Rodrigo’s redshirt freshman season for the Georgia Bulldogs now includes his elevation to All-American status for the 2016 campaign. The 6-foot-1, 192-pound place kicker was named to the Football Writers Association of America (FWAA) Freshman All-American team on Jan. 9. Rodrigo and tight end Isaac Nauta were selected along with four other representatives from the Southeastern Conference. Georgia, Florida and Ohio State were the only teams with two selections. The FWAA is composed of more than 1,400 sportswriters who cover football nationally. It is the 16th Freshman All-American team the group has selected. The team is composed of 34 first-year players, either true or redshirt freshmen. In December, Campusinsiders.com selected Rodrigo as an honorable mention All-American place kicker, behind first team pick Louis Zervo of Ohio University and second teamer Ricky Aguayo of Florida State. Rodrigo’s placement probably was restricted by his season numbers; he took over point-scoring duties in the fourth game of the season and finished as Georgia’s regular-season leading scorer with 61 points, then later adding 7 points in Georgia’s 31-23 Liberty Bowl victory over TCU. Also in December, he was named to 247sports.com’s freshman All-American squad (there was no second team or honorable mentions), but he was replaced later in the day with a notation that only true freshmen were eligible. Rodrigo redshirted last fall behind senior Marshall Morgan. Rodrigo was chosen to various All-American teams in seventh through 12th grade, capped by his appearance for the East team in the annual U.S. Army All-American Bowl in San Antonio’s Alamodome his senior year. His selection by FWAA as well as Campusinsiders.com thus becomes his seventh straight eligibility year of being accorded All-American status by at least one service. Rodrigo was selected to SEC’s all-freshman squad. He capped his outstanding redshirt freshman season by being selected to the Southeastern Conference’s all-freshman team, released on Dec. 8. Rodrigo was joined on the team by current Georgia teammate Isaac Nauta at tight end, and also by former Sprayberry High School teammate Jabari Zuniga, defensive end from Florida. Rodrigo led the Bulldogs in regular-season scoring with 61 points despite not taking over the place-kicking duties until the fourth game. Wide receiver Isaiah McKenzie had a 30-point lead over Rodrigo through the first three games, but Rodrigo caught and passed McKenzie in the last game of the regular season, scoring 9 points against Georgia Tech while McKenzie had his 10th touchdown, finishing with 60 points. Rodrigo was also named a first-team SEC all-freshman by Athlon Sports media outlet. Making the second team was Missouri place kicker Tucker McCann, who scored 57 points for the Tigers. Rodrigo’s field goal percentage was 81.3 percent; McCann’s 50; Rodrigo’s PAT percentage was 100; McCann’s was 90.7. For the season, Rodrigo missed three place kicks; McCann missed 10. Rodrigo, Zuniga and current Auburn offensive lineman Bailey Sharp all graduated from Sprayberry in 2015, and all were redshirted in the fall of 2015. Rodrigo enjoyed attending the Bulldogs’ annual Senior Gala awards banquet on Dec. 4, and he was included among the honorees when he was named Special Teams Most Improved Player for the 2016 season. Rodrigo was the starting kickoff specialist for all 12 games, and took over place-kicking duties in the fourth game against Mississippi. In those nine games, he led the team in scoring five times with a season-high 13 points against Kentucky, including the game-winning field goal as time expired as Georgia won 27-24. He also provided the margin of victory the following week with a pair of fourth-quarter field goals to help defeat Auburn 13-7 after the Dogs trailed 7-0 at halftime. That game also featured a rarity: a kickoff that hit the crossbar; it was a career-best 80-yarder for Rodrigo. He was named Special Teams Player of the Week four times during the regular season. SEC Academic Honor Roll selection for Rodrigo. Seventy-five University of Georgia student-athletes were named to the Southeastern Conference Academic Honor Roll for the 2016 fall semester, including Rodrigo and 22 of his football teammates. Rodrigo made straight A’s during fall semester, raising his overall GPA to 3.74 to ensure his selection for the academic honor. Rodrigo’s major is digital and broadcast journalism. Athletes from the cross country, soccer and volleyball teams were also chosen. Rodrigo joins list of Dawgs’ last-minute field goal heroes Rodrigo took his place among the Bulldogs’ short list of elite last-minute field goal specialists with his game-ending 25-yarder against Kentucky on Nov. 5, and he was featured in the team’s game program for the Nov. 19 match against Louisiana-Lafayette and the Nov. 26 game against Georgia Tech. Page 58 listed all Georgia kickers who won a game with a field goal in the last two minutes or less, beginning with Ken Cooper’s 36-yarder with 1:30 remaining in 1956 that beat Florida State 3-0. The 17th and most recent entry is Rodrigo’s game-winner that defeated Kentucky 27-24 as time expired. He also provided the decisive points against Auburn on Nov. 12, but his pair of fourth-quarter field goals that broke a tie at 7 for a final score of 13-7 came too early in the period and weren’t eligible for the list. The most recent entry on the list before Rodrigo is Marshall Morgan, Rodrigo’s predecessor, whose third field goal of the game against Missouri in 2015 came with 1:44 left and gave the Dawgs a 9-6 victory. Morgan also had a game-winner in overtime in 2013 to beat Tennessee 34-31. Also on the auspicious list are Bulldog greats Kim Braswell, Alan Leavitt, Rex Robinson, Kevin Butler, John Kasay, Kanon Parkman, Hap Hines, Billy Bennett, Brandon Coutu and Blair Walsh. Like Morgan, Butler and Kasay are credited with a pair of game-winning kicks. Photos on the feature page included Butler, Morgan, Walsh and Rodrigo. Rodrigo has earned UGA special teams player of the week honors four times this season. Rodrigo’s future man-cave will require plenty of wall and shelf space, if his senior season of high school football is any indication. With his U.S. Army All-American selection and then participation in the 15th annual San Antonio Alamodome event topping the list, Rodrigo was chosen a total of 10 times for postseason honors, six of them as a place kicker-kickoff standout and four times as a punter. * U.S. Army All-American. He averaged 71.7 yards for kickoffs, converted all of his point-scoring opportunities (one FG, three PATs) and had an onside kick recovered by a teammate in the Jan. 3, 2015 extravaganza during his East team’s 39-36 loss to the West after trailing early 33-3. * Class AAAAA first team punter as chosen by the Atlanta Journal-Constitution. It was his second straight year for this honor. * All-classification state punter of the year as chosen by Kickdoctor.com, an Atlanta metro area kicking service. * Atlanta Touchdown Club all-metro place kicker of the year, encompassing all schools in all classifications for the greater Atlanta metro area. * Class AAAAA first team place kicker as chosen by Kickdoctor.com. * Class AAAAA first team punter as chosen by Kickdoctor.com, his second straight year for this honor. * Punter of the Year as selected by the Cobb County Touchdown Club, his second straight year for this honor. * First team place kicker as chosen by the Marietta Daily Journal for the Cobb County All-Star team. The previous year, Rodrigo was the MDJ’s first team all-county punter. * First team place kicker for the AJC’s all-metro Cobb County team, his second straight selection for this recognition. * First team place kicker for the Class AAAAA, Region 7 all-region team, his third straight year receiving this honor. Rodrigo and former Sprayberry High School teammate Bailey Sharp spend a few minutes together at Jordan-Hare Stadium following Auburn’s 40-17 win over Georgia on Nov. 11, 2017. 10th grade — Sprayberry varsity/junior varsity, 31 extra points, 8 field goals, 55 points through conclusion of season. All-American selection for fourth straight year. All-region, all-county selection. 11th grade — Named to the Georgia preseason Class AAAAA all-state team. Named to Georgia Junior Bowl team. Named first team punter on Marietta Daily Journal all-Cobb County team. Named first team punter on Atlanta Journal-Constitution all-Metro/Cobb team. Named first team punter on Class AAAAA all-state team. Named first team kicker on Prokicker.com All-American team. Named punter of the year by Cobb County Touchdown Club. Named first team all-state punter by Kickdoctor.com. Sprayberry varsity, 31 extra points, 14 field goals, 73 points. 12th grade — Named to U.S. Army All-American Bowl team. Claims Prokicker.com’s 2014 Top Prospect title. Named to preseason Class AAAAA all-state team. Named Class AAAAA first team punter. Named Region 7-AAAAA first team kicker. Named MDJ first team all-county kicker. Named Atlanta Touchdown Club metro kicker of the year. Named Cobb County Touchdown Club punter of the year. Named Kickdoctor.com’s state punter of the year, Class AAAAA first team kicker and punter. Sprayberry varsity, 47 extra points, 10 field goals, 77 points. Redshirt freshman season, University of Georgia — Named special teams player of the week for Nicholls State, Vanderbilt, Kentucky and Auburn games. Named SEC Special Teams Player of the Week for Kentucky game. Selected to All-SEC Freshman team. Named to Athlon All-SEC Freshman team. Named to FWAA Freshman All-American team. Named honorable mention freshman All-American by CampusInsiders.com. 26 extra points, 14 field goals, 68 points. Redshirt sophomore season, University of Georgia — Named special teams player of the week for Appalachian State, Samford, Mississippi State and Georgia Tech games. Named to UGA Athletic Association’s L.E.A.D. Academy for academic and community service leadership. Named to semifinalist list for Lou Groza Award. Named to CoSida District 4 Academic team. Named Quicken Loans Scholar Athlete for Georgia-Auburn SEC title game. Honors 2008-09 – Georgia Middle School Athletic Association All-Star; kicked first field goal in state sixth grade history, ranked No. 1 nationally by Ray Guy 2009-10 – GMSAA All-Star, FBU-Eastbay junior All-American, ranked No. 1 nationally by Ray Guy and Michael Husted, invited to elite Top Gun camp 2010-11 – GMSAA All-Star, FBU-Eastbay junior All-American, played for Team USA vs. Canada, set state junior records for kicking points (50), field goals (6) and longest field goal (47 yards) in one season, ranked No. 1 nationally by Chris Sailer and Ray Guy, invited to elite Top Gun camp 2011-12 – Eastbay-U.S. Army All-American, played for Team USA vs. Canada (5 PATs and 1 FG in 38-7 win), played five varsity and five ninth grade games for Walton High School, made 51-yard field goal in a game, ranked No. 1 nationally by Ray Guy, Chris Sailer and Kohl’s, selected MVP for Class of 2015 at Top Gun, Ohio State and Florida camps. Fall 2012/Winter-spring 2013 — Named to 7-AAAAA All-Region team as both kicker and punter. Named to Marietta Daily Journal all-county team. Wins Prokicker.com (Ray Guy) national championship in December. Named Prokicker.com All-American for 2012 season. Wins Adidas National Expo (Oneononekicking.com) field goal championship. Also, named to 7-AAAAA All-Region soccer team as center midfielder. Fall 2013 — Named to Class AAAAA preseason all-state team. Selected to play in Georgia Junior Bowl game. Named to Marietta Daily Journal all-Cobb County team as first team punter. Named to Region 7-AAAAA team as kicker and punter. Named to GSWA Class AAAAA all-state first team as punter. Named first team All-American kicker by Prokicker.com. Named Punter of the Year by Cobb County Touchdown Club. Fall 2014 — Named to U.S. Army All-American Bowl as kicker for East team. Named to Cobb Senior Bowl. Named to Marietta Daily Journal all-Cobb County team as first team kicker. Named to Region 7-AAAAA all-region team as first team kicker. Named Class AAAAA first team punter. Named Atlanta Touchdown Club all-metro kicker of the year. Named Cobb County Touchdown Club punter of the year. Named all-classification state punter of the year by Kickdoctor.com. Named Class AAAAA first team kicker and punter by Kickdoctor.com. Now as the Bulldogs prepare to take on the Alabama Crimson Tide, the role of Blankenship stands out as one of the biggest team advantages. He has proven to be, if not the best kicker in the country, certainly one of the best in the SEC. His foot could very well be the weapon that propels the bulldogs to a victory over the mighty Crimson Tide. Above: Rodrigo Blankenship went on full scholarship the week of the Notre Dame Game. He kicked two field Goals and two PAT's in the Dawg win over the Irish, 20-19. 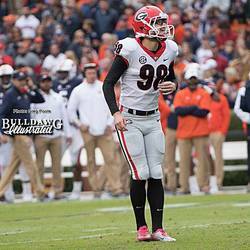 Below: Rodrigo Blankenship watches another field goal go through the goal posts in another Bulldog win.